Solidarity with the Workers of Natais popcorn factory in France! Exposed to hazardous substances, forced to work on precarious conditions, the workers tried to fight back. On Thursday, two former employees will be in court for supposedly "defaming" their former employer! 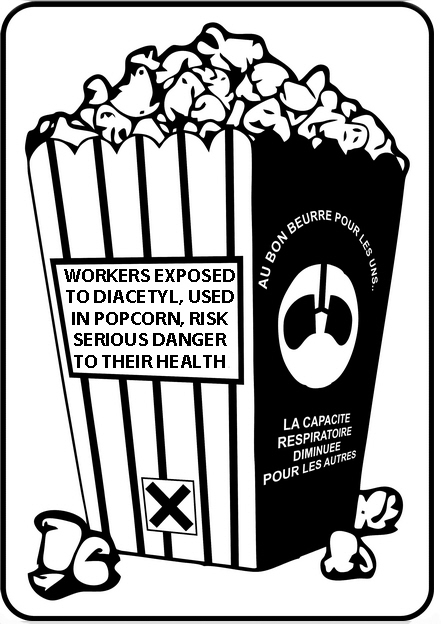 On Thursday, December 13, 2012, former workers from the Natais popcorn factory in Bézéril, France will go to trial for supposed „defamation” of their ex-employer, for talking about their working conditions on a blog. Among the problems the workers faced was exposure to Diacetyl. This chemical can cause bronchitis obliterans, also known as „popcorn workers' lung”, or other serious respiratory illnesses. Diacetyl is a component of the artificial butter flavor used in microwave popcorn. Bronchitis obliterans is irreversible and can lead to death. The workers at Natais popcorn factory are not even given masks to protect themselves from the vapors. They also must work in extreme heat. Around 80% of the people at the factory are temporary workers. The work is hard, people are sometimes forced to work on Sundays, the pay is bad. There was even a strike at the factory. A year-end bonus was won, but then the union called off the strike. Some workers however tried to keep fighting. For trying to speak out against these conditions, a case was brought against 2 of the strikers, now former workers of the company. You can also BCC or forward your mail to sia32@no-log.org, the local union in Gers which has been involved. Talking about Working Conditions is not a Crime! This is so terrible. Repression after already being repressed. Bronchitis obliterans is most likely no problem to tackle with a potential homeopathic medicine called Diacetyl Thirty. Have never heard of it. Please include the source of your information and more about this mysterious "potential medicine". In any case, it is also no problem to tackle if the company stops using Diacetyl on the popcorn and/or provides safety equipment. The former is preferable, because popcorn easters have also been exposed to health risks and even awarded multi-million dollar compensation by courts. There is some good news in this case reported by the CNT-AIT. The Natais workers went to court. It was 3 people, not 2 (sorry there was a mistake in the information). The bosses only real tactic was to portray these workers as dangerous anarchists. They said they could not tolerate the actions of the anarchosyndicalists anymore and gave as an example the fact that the company received faxes and emails from all over the world. But the Court of Justice in Auch reached a decision - that the company was guilty and awarded the workers moral compensation. The comrades in the area say that the struggle is not over yet, but are pleased with this development. Anyone got a link where I can read more about this? Thanks. The site of the union involved is here: http://sia32.lautre.net/ but it is very hard to find the old articles.